Have you ever heard of Neem oil for psoriasis and its amazing benefits for skin? The sanskrit name of Neem tree means: “to give good health”. As a matter of fact, it can bring lots of hope to psoriasis sufferers! In Ayurvedic Medicine, this herb is very popular. 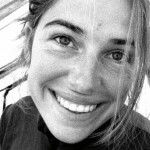 If you go to India, you’ll see that many people use it over there – either internally or externally. It’s a powerful herb that can tremendously help with digestive problems and skin issues, such as psoriasis. The recipe I’m sharing with you here is very easy to make. You’ll just need 3 ingredients, and it will take only 5 minutes of your time. 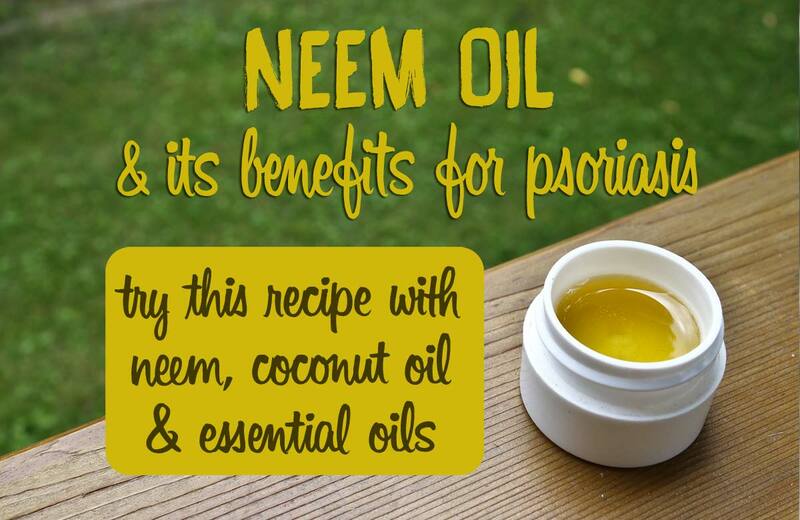 This neem oil recipe will help soothe the irritation, itching and scaling associated with psoriasis. Learn about the benefits of neem oil for psoriasis and include it in your skincare daily routine for best results! 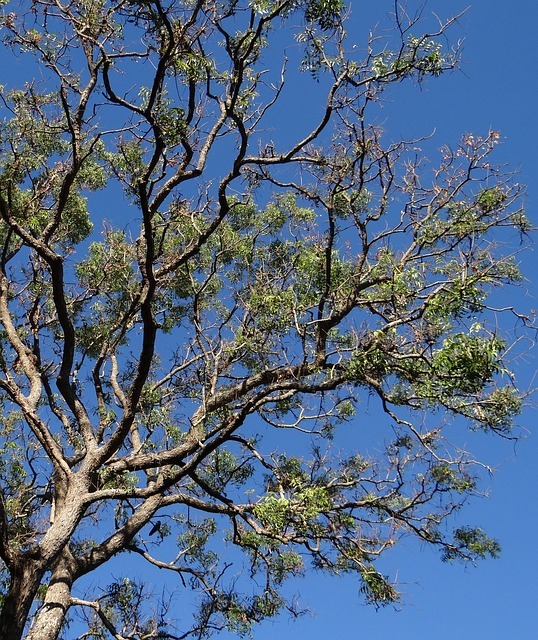 What’s Neem and where does it come from? Every part of the tree has a use. The leaf and bark are used in teas, cosmetic and medicinal preparations. Neem oil has gained lots of popularity and is now commonly used in shampoos, skincare products and even as a natural pesticide. What are the benefits of neem oil for psoriasis? First of all, neem oil is a great oil to moisturize dry cracked skin and protect your skin. In addition, neem supports healthy liver function and is often recommended as blood cleanser. These qualities can be very helpful in the treatment of psoriasis. Neem is mentioned in most Ayurvedic formulations for the treatment of skin disorders because of its detoxifying properties. Studies show that neem boosts levels of protective enzymes and decreases level of damaging chemicals. The reason behind it is probably because neem is rich in antioxidants. Antioxidants fight off free radicals that damage cells (source). This is one more reason to use neem oil for psoriasis. Antioxidants are very important for skin health. Neem is a powerful herb. 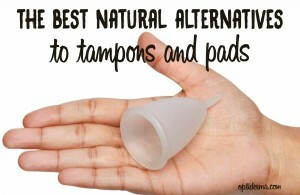 It should not be used in infants or if you are pregnant – or would like to get pregnant. 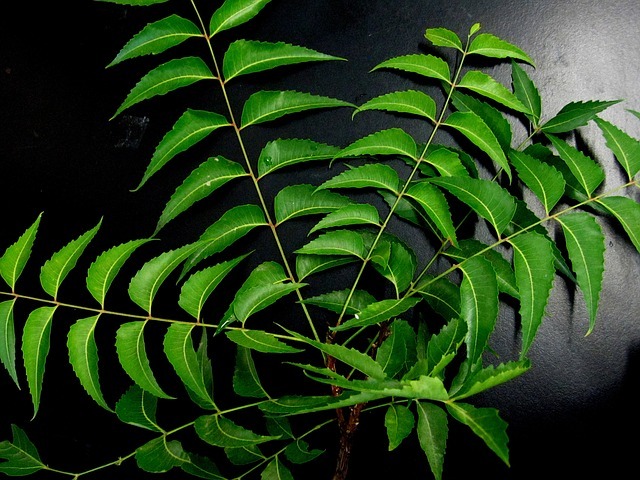 If you have an history of stomach, liver or kidney illness, you shouldn’t use neem leaf internally. Can you use pure neem oil for psoriasis? Neem oil may be applied pure on your skin. However, it’s not recommended for people who have sensitive skin. Also, the smell is strong and not very pleasant! Neem oil has a garlic-nutty smell. But don’t be afraid, you can easily cover the smell with essential oils. For these reasons, It’s better to mix it with other ingredients that are also very beneficial for psoriasis, such as coconut oil and geranium essential oil. Why use coconut oil as a carrier oil? Coconut oil has lots restorative qualities and is an ideal moisturizer for psoriasis. I personally use it all the time! It’s non-Allergenic – even on sensitive skin, it will not cause allergic reactions. It’s efficiently absorbed and doesn’t leave a greasy residue. It nourishes and smooths skin by exfoliating layers of dead cells. 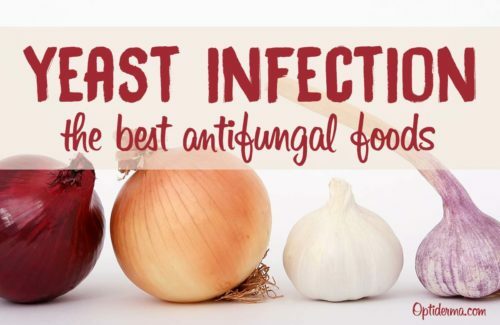 It’s antiseptic – About half the saturated fat is lauric acid, with antibacterial, anti-fungal, and antiviral properties. What about Geranium essential oil for psoriasis? Geranium oil helps improve circulation and lessen inflammation. It also promotes the growth and regeneration of healthy cells. What I like the most about this oil is that it works to relieve stress and anxiety. Having psoriasis can be very stressful, and stress itself can also trigger outbreaks. Stress management can help keep psoriasis under control. Geranium essential oil has powerful effects to uplift spirits and mental functioning, which makes it useful in the treatment of depression and chronic anxiety. Research has shown it can have a positive effect on eczema too. If you don’t want to use geranium essential oil, I recommend that you check this page about the best essential oils for psoriasis. Lavender or tea tree essential oils can be good options too. Neem oil (1/4 teaspoon) – Choose certified organic neem oil that hasn’t been extracted with chemicals, like this one from Oleavine. How to make this recipe? It’s very easy! Mix coconut oil, neem oil and geranium essential oil together in a small container. 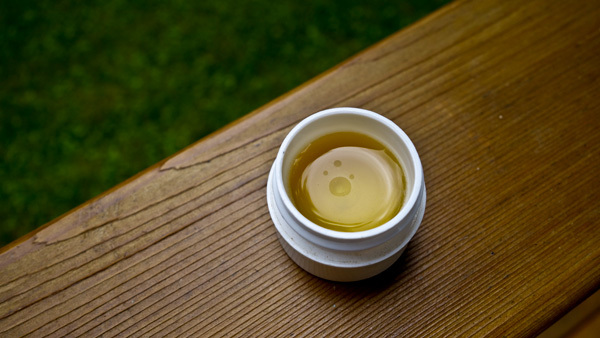 Pure neem oil hardens when it’s cold. It’s because the fatty acids clump together. What you can do is to place the bottle in warm water before you use it. The same thing applies to coconut oil. 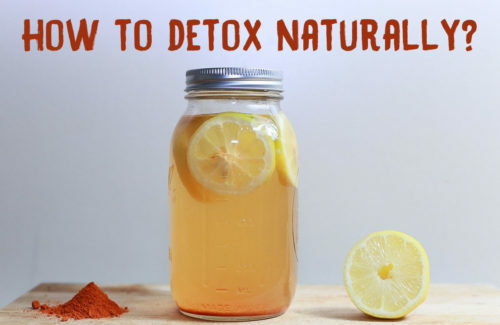 For this recipe, it’s better if neem oil and coconut oil are in their liquid form, so that the ingredients mix well together. This oil combination can be used several times a day to soothe irritated skin and heal psoriasic lesions. 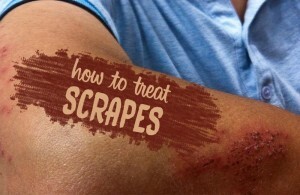 But you should do a patch test before applications. You can also use this cream for scalp psoriasis. An ideal time to apply it is after showering when your skin is primed to retain moisture. To maximize this benefit for scalp psoriasis, wrap a warm towel around your head for 15 minutes and remove scales with a wide-tooth comb. Neem products, such as neem oil, neem leaves and neem tea, should not be consumed by pregnant women, women trying to conceive, or children. There is some evidence that internal medicinal use of neem oil, may be associated with liver damage in children. Also, geranium oil can have sensitizing effects in rare cases. Since it influences certain hormone secretions, geranium essential oil is therefore not advised for use by pregnant women or for those women who are breast-feeding. If you like this recipe, feel free to share it on social media and don’t hesitate to leave a comment below! Also check out my post What Works Best for Psoriasis. You’ll learn how I deal with psoriasis on a daily basis and the natural treatments that work for me. 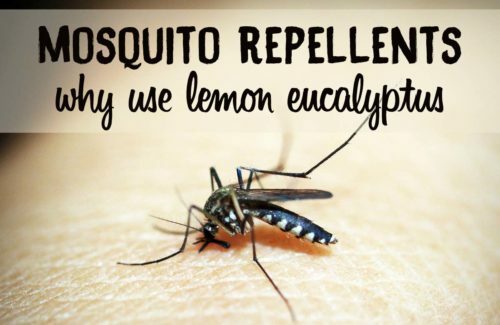 Did you know that you can use neem oil as a mosquito repellent? Learn how to make your own neem oil spray!